Avant-garde: A woman and her sax. And a brilliant mind. It was bitterly cold outside this last Friday night in Berlin. There was no one in sight when I had reached the dark ruin at the end of an unlit backstreet. And finding my way through the long cellar corridors of Musikbrauerei, with its brick walls and metal newel stairs, I ultimately felt like going to some secret gathering. And indeed, the performance of Matana Roberts, just like her epic record trilogy COIN COIN, was very intimate and demanded proximity and attention. Sitting alone on the stage with her sax, microphone and effect machines, she handles all channels as much like the operator of a control centre as a one-woman-orchestra. With the wall at the back of the stage as a huge canvas, the visuals projected onto it are an integral part of this soundtrack of history: pictures from the archives, mixing documents and portraits, black and white faces, farmland, industries, schools and private homes – all located in the South of the US. Roberts turns around from time to time, improvises to the pictures, shifts voices, sounds and dynamics. And the audience is magnetically absorbed by her performance and the visuals. 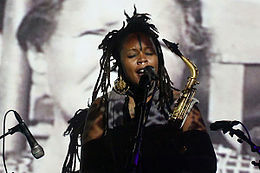 Matana Roberts is not only a musician, she’s a storyteller. She mixes various media to create a multilayer soundscape, an immersive physical narrative. And like the story she is telling, it’s not a ‚beautiful‘ or ‚pleasant‘ soundtrack to run unnoticed in the background. There are extremes in volume and frequency that let your ears ring and your guts convulse. There is no simple and steady rhythm that allows you to beat time. There are hopeful harmonious lines sung over dark doom sounds. There are repetitive patterns and noisy loops that make you feel unsettled, confused, maybe even depressed and sick. We hear fragments of American standards mixed up with sound effects and field recordings. And improvising on top, Roberts shifts from whispering to screaming, from singing to speaking and from harmony to discord. But of such emotional diversity is the story that Roberts has processed in COIN COIN: the story of African-American people in the US and/or AmeriKKKa. She travelled around in the American South to capture the legacy of the American slave trade. And out of the collected testimonies, sounds and archive recordings she made a collage of different experiences from centuries of Black life, culture and knowledge. These fragments are in the music, in the lyrics and even in her self-designed album artwork. Mixing these accounts of others with her own perceptions renders a panorama that is broader than the views and opinions of a single individual. Like a historian and researcher, Roberts lends her skills and talent to the narrative and not the other way round – a technique she herself has aptly termed “panoramic sound quilting”. The sax player from Chicago lives in New York City and is considered a representative of the so-called „Modern Creative“ – a contemporary experimental jazz-category; a mix of Modern Jazz, Free Jazz and Creative Music. Whilst Roberts was recording with a jazz orchestra in COIN COIN Chapter One: Gens de Couleur Libres, she had already reduced her ensemble for COIN COIN Chaper Two: Mississippi Moonchile. Now, for COIN COIN Chapter Three: River Run Thee, she’s on tour with her solo improvisation. And steadily she has thereby progressed from conventional musical structures to her latest apocalyptic masterwork – it’s harrowing and it’s brilliant!